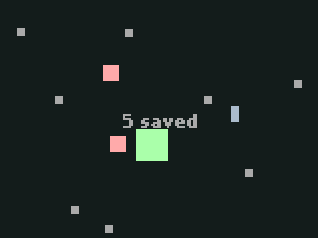 I’ve had a busy few days, but I decided to set aside the time to do another super-mini game jam today (note that even when I spend just 15 minutes developing, the actual time from start to publishing the game+source code+screenshot+blog post is probably closer to 45-60min). The other day I was exploring PhotonStorm’s Flixel Power tools and came across the FlxVelocity package: this has a few neat little features likely quickly calculating distance and moving objects towards one another, so I decided to make a game around that. I actually managed to keep within the time limit today, and ended up with a game about sheep herding. I’m actually fairly proud of this one as it’s a little bit different and I think it showed a pretty good use of available libraries (though I could have done more, like making the wolves also chase the player if they got too close).